A few years ago, I wrote a post about the youngest son of Joseph Harman and Sarah Mulberry of Byaduk and formally of Melbourn, Cambridgeshire. “Alfred Winslow Harman – Stepping out of the Shadows” was so named because research for the post uncovered things about Alfred I hadn’t known. Finding a photo of Alfred was the next aim and I thought I had just one shot at it…a photo of the Rupanyup Rifle Team c1880-90. Having seen their great Facebook page, I thought I would contact the Rupanyup Historical Society. I soon heard back from Helen, the society’s Secretary. The society had a meeting the following evening and the President was an expert on the Sargood Shield. That was great news as the Rupanyup Rifle Club had great success in the Sargood Shield, a highly prized annual competition between Melbourne and country Victorian teams. Alfred was captain of the team in 1886. Helen came back to me after the meeting and finally I was able to see Alfred Harman, out of the shadows and in broad daylight. 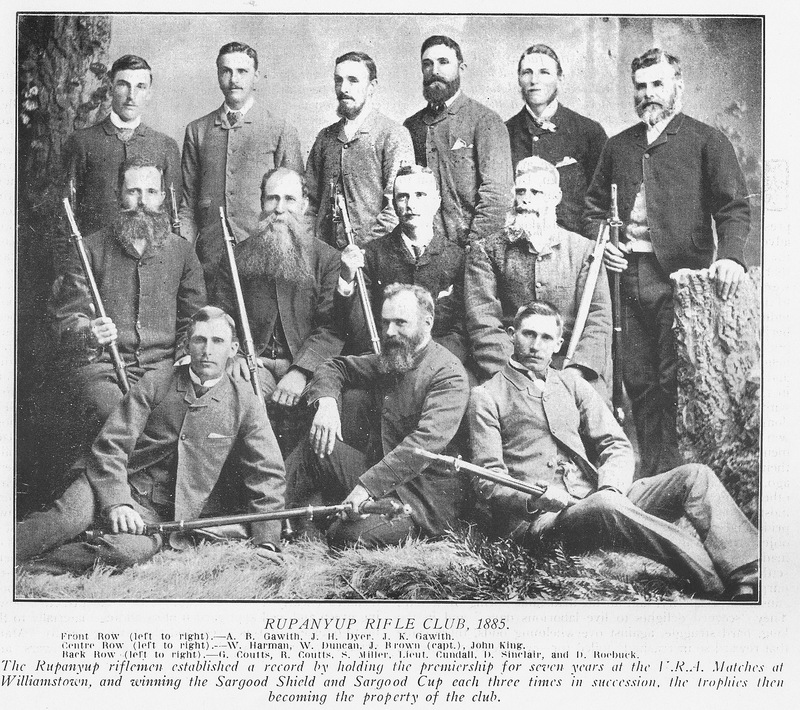 Helen had emailed me a photo of the 1885 Rupanyup Rifle Club. Alfred is the middle row, first on the left in this photo of the 1885. To give you some idea about where he was in his life, he was thirty-three years old, married for seven years and father to a six-year-old son. His brother-in-law Samuel Miller is in the back row, third from the left. There are some impressive Hairy Mancestors among them. 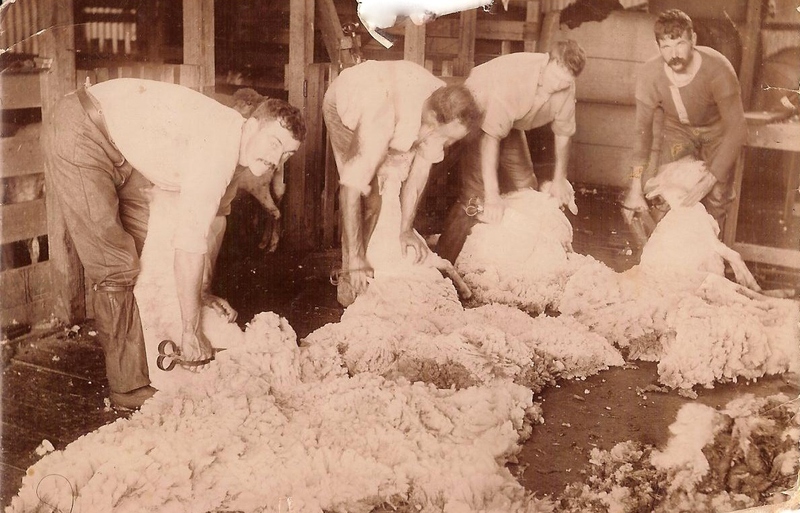 Image courtesy of the Rupanyup Historical Society. Thank you so much to the Rupanyup Historical Society. Please go and check out their wonderful Facebook page on the link – Rupanyup Historical Society Facebook Page. It was there I found WW1 photos of Alfred Harman’s great-nephews Robert and George Cruikshank, my 2nd cousins, 3 x removed, who grew up in Rupanyup. I also found photos of members of the Loats and Starbuck families who had lived in the Muddy Creek area, near Hamilton, and with whom I have family links. This entry was posted in Harman and tagged Harman, Loats, Miller, Rupanyup, Starbuck. Bookmark the permalink.